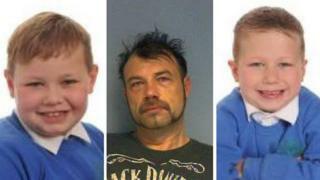 An "urgent" police search is under way for a missing man and his two sons. Michael John Cole, 43, Michael Lee Cole, eight, and Harry Cole, aged seven, were reported missing from Arborfield in Berkshire on 2 October. Supt Shaun Virtue of Thames Valley Police said he did not believe the father posed "any immediate risk" to the boys but that there were concerns for their long-term welfare. The force said the boys parents are currently separated. It added that a "substantial amount of work" had been carried out after the initial missing persons report was made, but since the granting of a court order it could now make a public appeal. The family are part of the travelling community and the boys parents both maintain parental responsibility for the children, shared with the local authority. They were last seen in Grazeley, near Reading, on 8 September, and the boys have not been in school since. In his appeal, Supt Virtue said: "Any information, no matter how insignificant you think it might be, about Michael John Cole or the two boys, might help our investigation to ensure they are found safe and well." He added: "We have had help from a number of family members, friends and local residents during our investigation but so far, unfortunately, we have been unable to locate Michael John and his two sons." Supt Virtue said there were concerns about their "access to education and to the National Health Service should it be required in the future". "We're not clear around the motivation of Michael taking the two boys off," he later told the BBC. "We don't think they're under immediate risk from Michael, however, the longer they're away, the bigger the risk that they have." He said his message to Mr Cole was that "this has gone on too long, and what we would ask is that Michael return home with the two boys - hopefully they're all safe and well." Mr Cole is described as white, of medium build, with short dark hair, and was last seen with a dark beard. Michael Lee Cole is white, of medium build, with short blond hair and blue eyes. Harry Cole is white, of a large build, with short blond hair and blue eyes. The boys' father is said to have links in the county to Wokingham, Bracknell and Reading. Mr Cole also has connections to Basingstoke in Hampshire, Ludlow and Shrewsbury in Shropshire, and Bridgend and Newport in Wales.